Hello and good day..Due to fact we have no delivery charge and have not had a price increase in quite some time, we are forced to raise our prices a little for each box, effective this upcoming week, March 25th. Price of produce keeps going up and with giving employees a living wage, makes it tough. Please check out the produce bins page for information on price changes. We thank you so much for your understanding and support! Is a locally owned and operated Portland organic produce delivery company. We've been delivering the finest, farm fresh, local organic produce and groceries year round since early 2001. 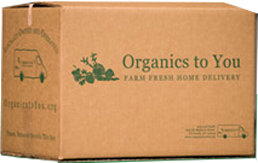 We work with Local Farmers & other local purveyors of organic produce & deliver to you to enjoy! We provide a wide array of choices. All you need to do is sign up & the best, freshest, local, organic produce will come to your door! April is already here! We've got a lot of beautiful organic seasonal fruits and veggies coming in. See what's in the current contents of this week's bins. Our Monday through Thursday delivery schedule is broken down by sections of the city, helping us optimize our fuel and delivery efficiency. Why Get Organic Food Delivered? Hello. Thanks so much for bringing such fresh fruit and vegetables delivered to our door every week. We're very happy with your service and continue to recommend Organics to You to our friends. We especially enjoyed the mini watermelon which came with the last bin. What a special little treat!